Siesta Key vacation rental-minutes to beach and shopping! 3 bedrooms ( with futon sleeps 8), 2 baths, pool and sauna. A 5 minute ride to Siesta Key beach, this 1,750 sq ft home with open floor plan is located in a lush, tree lined neighborhood just minutes from shopping and restaurants. A breath away from downtown Sarasota (10 min), this rental brings you serenity and convenience, perfect for your Florida getaway! Lounge on the patio in the lanai and shaded backyard. Enjoy the custom sauna and private shower in the master bedroom. Bedrooms include queen beds with cable television and ample closet space. Second full bath has a large vanity and all rooms (plus patio) include ceiling fans (home also has central air). Eat in kitchen offers full stainless steel appliances and BBQ grill off the back patio. Living Room: Plenty of seating is available in the open living room with bright views of the backyard and access to the patio. Vaulted ceilings and tiled floors invite a casual and comfortable beach rental. Amenities: Washing machine and dryer on premises, bed linens and towels provided. On exit, cleaning service included. Just 20 Minute drive from Sarasota Airport, and a short ride away from Downtown Sarasota or to Festive St. Armands circle shopping area. Very close to all major shopping. If you have never been to Siesta Key, you might want to stay a long time! Pet friendly Please,no smoking! Great home in quiet neighborhood. Nice home. Worked well for us. Kids spent hours in the pool. Great seating near so we could keep an eye on them. Enjoyed our time at this home. 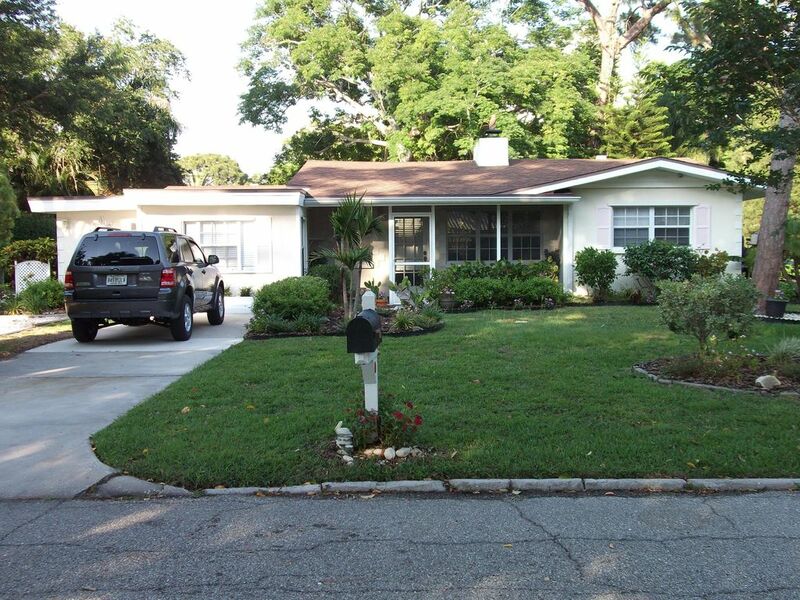 Beautiful neighborhood and close to Siesta Key beaches. We are glad you enjoyed your stay and are welcomed back anytime in the future- thanks very much! Great place to stay! Can’t wait to go back. Perfect area, close to everything we wanted. back anytime you would like to visit in the future! Great location and nice comfortable home. The house is very comfortable and location is great. The pool is also a nice size. All in all, great rental property. We book rentals quite often and have many good experiences.This house is in a good location not far from the beach, it has a swimming pool, it´s a quiet area close to a big park. There were problems with this house during our stay. When we arrived we found out that the dishwasher was not functioning and all the kitchen ware, plates etc. were dirty. We had to hand wash everything before we could use it. We never received a reply from the owner regarding these issues. The house overall was not very clean and we found all kind of dirt and macaroons in the sofas, under the beds to mention a couple of examples. There is a hole in the roof by the chimney and it leaked water in to the house during heavy rainfall. One of the slide doors fell out of its tracks without anyone touching it. The AC unit in the master bedroom does not heat and it was cold in the room the first couple of nights. The WiFi signal is quite week. We did except the house and the tools in the kitchen to be clean when we arrived for check in and expected the equipment in the house to function properly. Thank you very much and hope to see you again anytime in the future! The St Armand's Circle shopping area is just a short ride in downtown Sarasota.It has more than 100 unique shops and venues. Don't miss the Sunday evening drum circle on Siesta Key Beach while watching the perfect sunset.